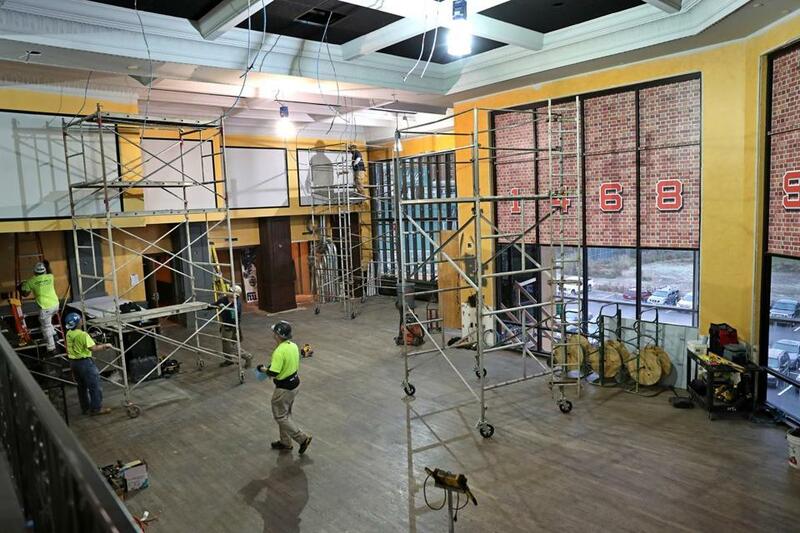 Workers readied the sports betting area last week at Twin River Casino in Lincoln, R.I.
LINCOLN, R.I. — It’s a far cry from Vegas, the humble betting window under construction on the grandstand of the Twin River Casino’s former horse- and dog-racing track. But in New England’s first experiment with sports betting, fans will be able to place legal wagers on their favorite teams here by the end of Thanksgiving week. In December, the casino will add a flashy sports betting lounge, with screens showing live games and odds from around the country. Gamblers will be able to grab a beer and a burger in a sleek bar area as they watch with money on the line. A rendering of Twin River’s sleek sports betting lounge. “It gives us the opportunity to attract a new customer base,” said Gerald S. Aubin, director of the Rhode Island lottery. It’s a cautious first step. Rhode Island won’t allow remote betting from computers and phones. Next year, though, gamblers who are at Rhode Island casinos will be able to wager from their devices. New Jersey and Nevada allow online sports bets from anywhere within their borders; West Virginia and Pennsylvania will soon follow suit. Delaware and Mississippi, which have authorized sports betting as well, have more limited programs. Rhode Island will also begin with relatively few betting options. The casinos are not yet prepared to take “prop bets,” which are wagers on the probability of certain events happening during a game (say, a specific player scoring two touchdowns). Those restrictions could make it harder to attract the legions of sports betting enthusiasts who are already gambling illegally on their phones via a robust black market of bookmakers and offshore websites. The market for illegal sports betting is huge; some estimates have pegged its value at more than $100 billion. Until the Supreme Court ruling last year, Nevada was the only place in the United States where conventional sports betting was legal. David Cacciatore, a Waltham resident who enjoys sports betting, said he’d be unlikely to travel to Rhode Island just to wager on a game. “People who bet on a more consistent basis . . . I don’t know that they’d be winning that crowd over, because of the convenience of going to that local guy and betting through your phone or your laptop,” he said, referring to the black-market options that exist today. However, Cacciatore said the chance to bet on games could entice him to select one of the Rhode Island casinos over other gambling establishments if he was planning to spend a night at a casino anyway. Rhode Island officials hope so. The state has struggled to balance its budget in recent years, and gambling — including the addition of table games in 2013 — has become the state’s third-largest revenue source. Twin River Casino, above, is one of two casinos in Rhode Island that will offer sports betting. A 2016 report by the Rockefeller Institute of Government found that Rhode Island had the highest amount of gambling revenue per adult resident of any state. “The facilities, both Twin River and Tiverton, are tremendous revenue generators in Rhode Island. We rely heavily on the revenue stream,” Gerald S. Aubin, director of the Rhode Island lottery, said in an interview. “It gives us the opportunity to attract a new customer base, new demographics, which are essential for us to continue to grow,” Aubin said. The state has been facing an increasingly competitive environment for gambling dollars. 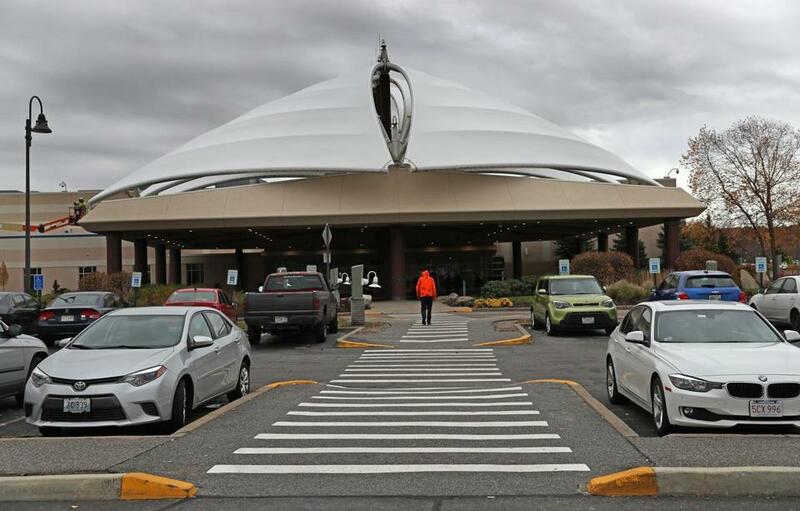 Connecticut’s popular Mohegan Sun and Foxwoods casinos are nearby, and Massachusetts recently opened its first full-service casino in Springfield. The massive Encore Boston Harbor casino in Everett will provide stiff competition in the Boston market when it opens next year. But so far, none of Rhode Island’s neighbors have legalized sports betting. Rhode Island had originally estimated that it would take in $23.5 million in tax revenue from sports betting by next July. But proceeds are likely to come in lower than that because of delays in setting up the facilities for sports betting and the development of software to support it. Because the state missed its planned opening date of Oct. 1, Rhode Island lost out on revenue from the World Series, the start of the NBA and the NHL seasons, and the bulk of the year’s NFL games. Rhode Island’s competitive advantage on legal sports betting may diminish after lawmakers in neighboring states resume debate on the issue next year. Massachusetts and Connecticut could authorize more expansive sports betting laws, potentially allowing mobile betting either via a casino or an independent sports-betting app. They could also enact lower tax rates, or allow more gambling companies to compete in the market. Rhode Island will collect 51 percent of the proceeds after payouts to gamblers, one of the highest rates in the nation. And Rhode Island only lets the casinos offer the service, with help from one bookmaker: William Hill. Mary Murphy, a project director at The Pew Charitable Trusts who has studied the dynamics among states for traditional casino revenue, said regional markets have generally been fixed in size. “If a new business opens, it’s going to be cannibalizing business from other establishments,” Murphy said. She added, however, that sports betting could follow a different pattern. Rhode Island will have to navigate a complex legal landscape if lawmakers there want to expand sports betting beyond the physical terrain of the casinos. Mobile sports betting, for instance, would likely require approval from voters, which would mean another face-off with a veteran core of antigambling activists who have been fighting expansion for years. The current state of gambling in Rhode Island has been shaped by a series of contentious referendum questions. Liz Taber, president of the Newport-based group Citizens Concerned About Casino Gambling, said voters should have had a say on whether to allow sports betting at casinos. The state hurried to legalize it, she said, because it’s overreliant on gambling revenue.